“For now we see in a mirror dimly, but then face to face. Now I know in part; then I shall understand fully, even as I have been fully understood” — 1 Corinthians 13:12. Yet the thing that these atheists forget is that much of modern science is imaginary in a similar sense. Take, for instance, the atom. 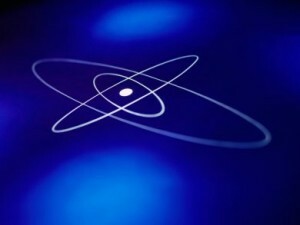 The atom is the perfect symbol of modern science. In practice, modern science seeks to reduce everything to its basic elements; the atom is the basic unit of differentiated matter. Science also leads the way to technology, and what symbol of technological power is more potent than atomic power? Yet this central element of modern science, the atom, is in a real sense imaginary. Let me explain what I mean. We know ordinary things by apprehending them immediately with our senses. For example, you can see and touch the desk in front of you. Our senses, however, are limited, and there are many things that they cannot directly detect — things such as atoms. These sorts of things we know not by immediately apprehending them with our senses, but rather by inferring them indirectly through their effects. Atoms are in this category. Atoms are known from a distance. You might object that we know atoms because we can feel them. Tap on your desk — it’s made out of atoms. There they are, plain as day. Except that it’s not plain as day. The only reason we know that things like desks are made out of atoms is because scientists have done very precise, controlled experiments and made very careful observations of effects that have allowed them to infer what atoms must be like. Yet atoms are not really like your desk at all. An atom that is part of your desk behaves very differently than your desk behaves. Your desk is immediately apparent to your senses; its atoms as such are not. Yet you are nevertheless justified in believing that your desk is made out of atoms, and in believing that the features that belong to your imaginary picture of atoms are true. The experiments and observations that have led to the conclusion that atoms exist, and given us some idea of their properties, have been tested and supported by years of scientific research. You can’t see atoms, but you can know by their effects that they exist and what they are like. You can, if you wish, imagine them, picturing protons and electrons whirling about in space. Your imaginary atom, however, is not a real atom. It is based on a real atom, and it contains abstracted truths about real atoms, but it remains, at heart, a reconstruction in your mind. Still, the fact that atoms are known only through their effects and not directly doesn’t make them unreal. Approaching God with the intellect is similar. Unlike either desks or atoms, God is not a material being. Unlike the desk, He cannot be apprehended by the senses directly. However, like atoms, God can be known through His effects. The evidence for atoms is scientific, and includes the results of a whole body of laboratory experimentation and observation. The evidence for God is philosophical, historical, and personal. It is found in the arguments that show the need for a Creator and an Absolute Being at the base of all reality; it is found in the historical witness of Christ and His Miracles; it is found in the evidence of the saints and the changes that grace can make in the lives of the faithful. We cannot behold God directly, in this life at least. In our earthly state, it may very well be the case that our earthly images of God must be contained in the imagination — but then so are the vast majority of our scientific images as well. The important question isn’t whether God is as apparent as ordinary material objects, any more than it is important for science that atoms be apparent to the senses. The important question is whether the evidence for these things exists. In both the cases of atoms and God, the evidence is overwhelming. You seem to go a bit too far when you claim that one can *know* that “things like desks are made out of atoms”. The atom is an element in one or another scientific theory. Such a theory might one day be ruled out by observation, but the theory can never be ruled in. The atom is a useful concept, but the existence of any corresponding object in reality is not certain. Scientists 500 years from now might look back on our present atomic theories of matter as quaint but ruled out. The nature of scientific revolutions is such that the best theory of matter in some distant future might not involve the atom at all, except perhaps as an approximation, not a reality posited by the theory. A theory may posit a reality, but the success of the theory over some period in human history does not make what is posited real. The existence of God, however, is knowable in a way that the reality of objects posited by a scientific theory is not. Great analogy! Yet atheistic critics of religious thought rarely show much analytical ability. Today I was reading a short piece by Vittorio Messori reminding the atheist Mathematics professor Piergiorgio Odifreddi that Lourdes deserves the cientific method of historical analysis as much as anything else. All of that because Piergiorgio Odifreddi affirms that “obviously a priest told Bernardette what to say.” That is Odifreddi’s great critique! The fact that the Church fought the Lourdes apparitions tooth and nail for four years and tried to suppress the (the unauthorized) popular devotion at Lourdes does not faze Mr. Odifreddi at all. Anyone who reads the Church documents, newspapers, opinions, records, etc. contemporary to the apparitions will find out that Bernardette was chased out of the parish by the overzealous priest and had to suffer much rejection and criticism. To assume that the Vatican curia, the French press, the local priest, and Bernardette were all involved in a vast conspiracy to scam the whole world is to assume something impossible. Then one would have to explain one by one all the cures and miracles (like that leg that grew in lieu of the amputed extremity) as part of the same “vast Catholic conspiracy.” But Mr. Odifreddi with the simplicity of a fin de siècle socialist assumes a conniving priest. It’s easy and he doesn’t have to read any reports or do any research. The American counterparts of Mr. Odifreddi are the same. Some primitive tribe believes thunder is a god. We know better than that, therefore… any “god” is a false assumption, no need to look any further. That simplicity reminds me of the teaching of the Jehovah’s Witnesses: if one old pagan cult used the cross then the Cross is and will ever be of “pagan origin” and therefore unsuitable for Christian use. The principle is applied to anything they don’t like. all you have to do is to find an old pagan relic somewhere to do away with crosses, cassocks, priesthood, virgins, Trinity, Holy Communion, or anything! This is not putting the cart before the horse. It is putting the horse on top of the cart and asking us to pull it! I will mention i think it is theologically dangerous to ‘imagine’ God. Just as was pointed out by tevaughan that it is scientifically dangerous to image atoms. There should be a clear division between what we can and do know , through revelation , reason , etc. and what we don’t. But as soon as you attempt to use your human experience to create an image of God , esp God the father, what you can know with certainty is that you are wrong. There are too many men around who are angry at the white man with the beard, who sit’s on a throne and and zaps people who don’t obey him. So i can see where they would conclude , rightly so, that no such being exists. But that ‘image’ and for that part any other human ‘image’ is NOT God. It is interesting how much that connects with atoms. atoms, too, are unseen. The information that we have about them is incomplete, and possibly inaccurate in some respects. there is a claim that atoms are themselves made up of three entities ( protons , newtons , electrons ) and yet those break down to other smaller ‘things’. But these things aren’t solid , nor are they exactly matter, as we experience having more in common with light , in the sense they are wave/particle duality then matter. Worse yet most of these ideas, are derived from experiments that are nearly impossible to repeat , so we are left with the necessity of ‘the common man’ having faith in the sayings of the scientist. Which are much more difficult to understand then anything written by any theologian.